The TaRs research project found that RfP is strongly influenced by relationships between children, teachers, families and communities. Where shared understandings were established about the changing nature of reading and the value of everyday reading practices, these supported children’s RfP. These reading communities generated new kinds of talk about reading. Build new and more equal reading relationships with families and community members. In this film Dr Rachel Levy of the University of Sheffield draws on her own research to explore the barriers and motivations for shared reading in families. 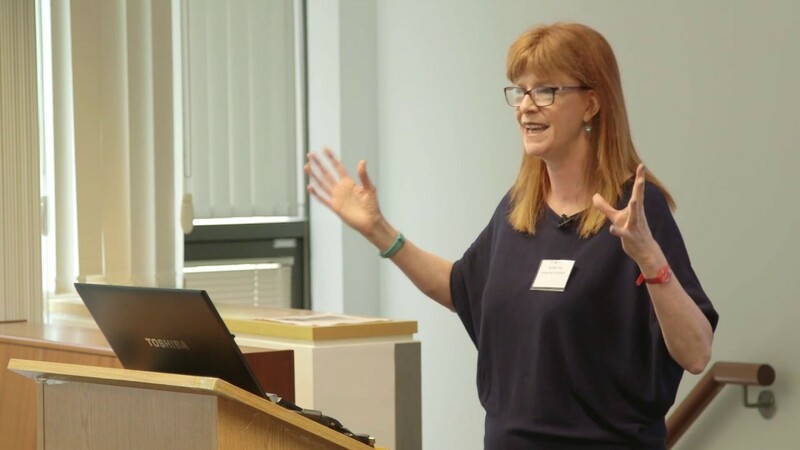 In this film Jon Biddle, winner of the Egmont/OU/UKLA experienced teacher award, and Professor Teresa Cremin discuss the importance of building reciprocal and interactive reading communities. The Teachers as Readers (TaRs) project was not designed to be an intervention aimed at raising standards, although children’s attainment did rise through the year. Instead it was organised to enable teachers to come together as readers and as learners, to become more conscious of their own practices as readers, widen their knowledge of children’s literature and explore ways to nurture children’s reading for pleasure. Initially however, the sorts of relationships around reading, between children and between children and teachers, were limited and were overwhelmingly founded on more formal exchanges around school-based texts being studied as part of the literacy curriculum. At the start of the project, teachers felt it was difficult to establish engaged reader relationships with the young people in their classrooms, in part due to space and time for informal reading conversations and because what counted as reading in schools was often limited in scope. As the teachers developed their own reading communities in local groups, they came to value the time as adult readers to read, share and discuss their reading; they also valued the space for reflection on these reading experiences. Through this process, they widened their repertories of children’s literature and other texts and learnt about themselves as readers, about reading in the 21st century and the socially constructed nature of reading. As a consequence, they began to share their increased knowledge and enthusiasm for children’s texts with their classes. Conversations about texts developed and reading aloud became for many a kind of bonding time. New and extended opportunities for interaction around texts developed: independent reading time was established; reciprocal reader-to-reader recommendations ensued; the emergence of spontaneous ‘inside-text talk’ was documented. Such talk was supported by more relaxed reading environments, and the presence of richly resonant class repertoires of ‘texts in common’. Teachers also found out about children’s reading lives beyond school and widened their knowledge of children as readers. Whilst differently shaped in every classroom, the social fabric of new reading communities began to be woven as commitment to reading and talking about texts developed. In such communities, in contrast to the teachers’ previous and more traditional instructional practices, diversity and difference were welcomed. Some teachers also began to build relationships with parents, carers, librarians and families and there were signs of boundaries beginning to be blurred between home and school practices. a shift in the locus of control that fosters reader agency and independence. The children’s pleasure in reading was strongly influenced by the new reading networks and relationships which developed. Children who were initially identified as reluctant, disinterested and disengaged readers became drawn into reading; their perceptions of their abilities as readers and self-confidence improved and their talk about reading and texts became more spontaneous, informed and extended. These changes appeared to be linked to their teachers’ enhanced subject knowledge and enriched pedagogic practice; it was also closely connected to their teachers’ reading identities and nuanced practices as Reading Teachers. Children’s attainment also showed above average increases across the year and children’s commitment to, and interest in, reading altered; they showed increased pleasure in reading and began to read both more regularly and more independently, contributing to the construction of lively reading cultures and classroom communities of engaged readers. The newly constructed reading communities that developed in classrooms fostered a sense of belonging and mutual commitment as well as increased interaction. The project revealed that reading for pleasure is a highly social process and that young readers are nurtured through their involvement in richly reciprocal communities of readers. Adapted from 109- and 154-5 in Cremin, T., Mottram, M., Collins, F., Powell, S. and Safford, K. (2014) Building Communities of Engaged Readers: Reading for pleasure, London/New York: Routledge. How often do you discuss what you are reading with other teachers/members of the school community? How often do you talk informally with children in your class about reading outside of planned literacy and guided reading sessions? When have you noticed that children take opportunities to talk informally about their reading between themselves? How aware are you of the ways in which children engage with other readers at home/in the community and the types of reading this involves? Thinking about the less confident readers in your class, which texts do you know they have recently shared for pleasure with parents/carers/siblings? How frequently are parents/carers/family members invited in to school/your classroom to read and talk about reading with children? Do you use your local library for school? When did you last visit your local library with a class? To what extent do you consider yourself to be a teacher who builds reading communities between teachers, children, families and the wider community? Rate this on a scale of 1-10, (10 being the highest). Why in your view do teachers need to develop reading relationships within and beyond the classroom? Seize opportunities for informal book talk, making connections between reading and children’s life experience and exploring personal experiences about reading in your discussions. As well as displaying images of diverse images of readers in school, invite these readers to your classroom to share their experiences and enjoyment of reading. Ask children to design invitations and posters to celebrate these events and write thank you letter afterwards. Once a week/month/half term, as appropriate to your school/setting, 15 minutes before school, set time aside for parents and carers to come in with their children to share texts. You might invite the TA to read in the reading area too. Vary the texts available, e.g. picture books, magazines or non-fiction. Creating an informal atmosphere allows parents and carers time without home pressures to read and talk about texts. Once a fortnight/month/half term create an after school time with tea and cookies to share books in family groups. Start small - it will grow. The local library may be able to provide book sets to borrow. Keep it low key and start each time by reading aloud and sharing your passion for reading and texts you have enjoyed or are currently sharing with the class. Invite the class to join you on a reading hunt in the local community to take photos of the myriad of signs, labels, symbols, texts evident locally and the reading available in the immediate community. Make a montage and explore, for example, the multiple languages used. You could ask children to take their own photos too as a homework project and possibly to ask their family/home community about what they notice. Many opportunities exist to celebrate the power of literature and other texts. Class and school communities participate for example in World Book Day, Readathons, The Big Read and so on and can run their own reading events/festivals/competitions and involve authors. Alone these can be tokenistic, but as part of planned support for RfP they work well. Map in opportunities to visit both the school and the local library regularly with your class. Be sure this is not just about book swapping time but also for book browsing, talking, sharing, and recommending – reading is a social process. Make time to discuss with children how to select books, as this can seem overwhelming for inexperienced library visitors.